Of all the tasks video games have attempted to make fun, "being stealthy" ranks just slightly above "planting a garden," and "fishing" (sorry Pro Bass Challenge fans). But wouldn't you know it - one of my favorite games of 2012 involved doing just that for many many hours. 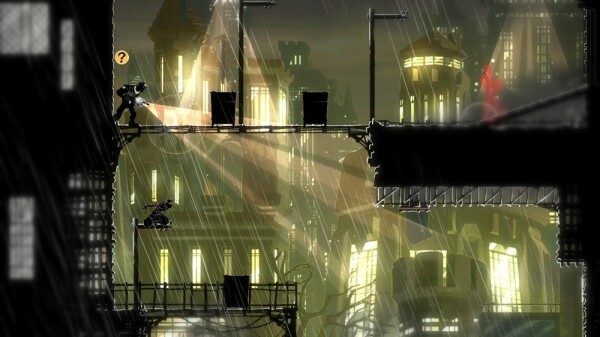 Mark of the Ninja truly embraces all the tropes that come with playing a modern day ninja - lying in the shadows, skulking in vents and dashing across rooftops to avoid detection, only attacking with the element of surprise on your side. And it's empowering as hell. Did I mention you get a blowfish-toxin-dipped terror dart later in the game that freaks enemies out, making them shoot at each other, and eventually committing suicide? Ok, less stealth-mechanics involved there, but still super awesome. Bonus points to this game for putting together a clever story with a final decision on the player that makes you question your character's sanity. The ambiguous ending - something I normally hate - leaves your decision hanging in the air and running to the message boards (for me at least) wondering if you made the right choice. For a game I imagine most people purchase purely for the awesome mechanics to have a discussion-worthy story (if only because of the twist, but still) is no small feat. Loyal readers of this blog would probably be surprised if I didn't mention this game, since I've written more posts about it than any other game/topic in 2012. 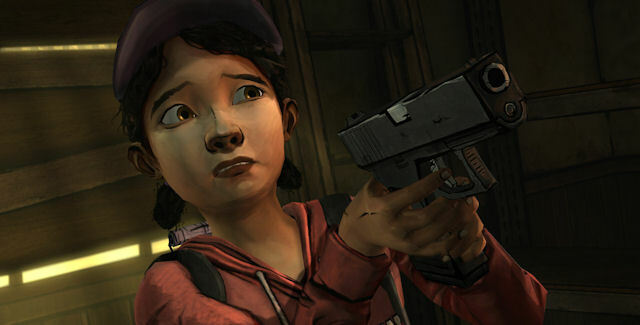 Critics of The Walking Dead game say there's very little "game" to play here, but I would argue the monumental decisions put in your hands are some of the toughest things I've ever had to do in a video game, ever, even if it only involved deciding between whether to press the "X" or the "B" button. I mentioned this in my last post, but I'll reiterate it here - the game's ending made me cry, and that has never happened to me while playing a video game before. So you know, kudos Telltale. For more insight into this incredible game, read my thoughts here, here, here and here. 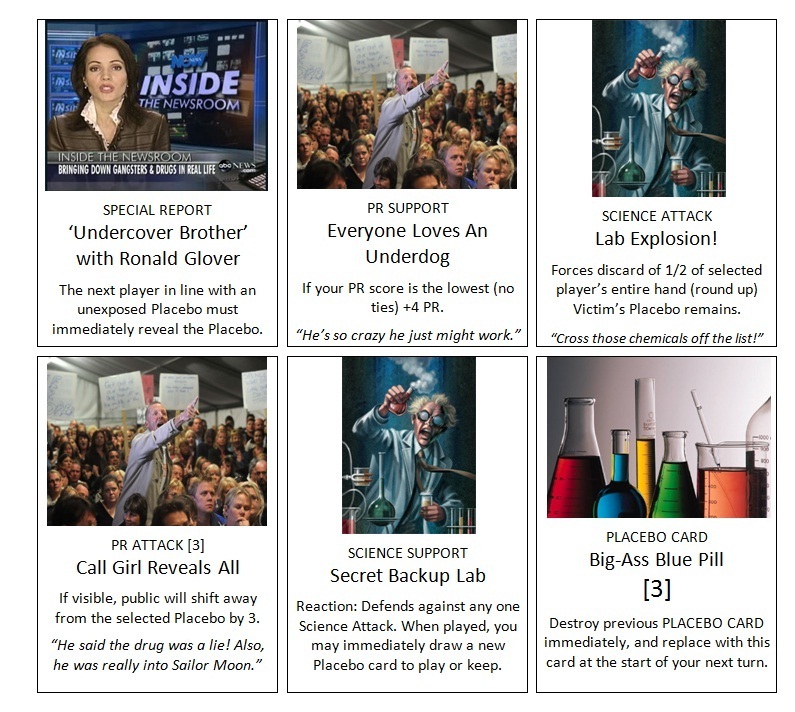 Unlike the other pictures in this post, the above snapshot is taken from an actual game I played. I took this picture after I'd just tried taking on the Rebel Flagship (which it was my mission to destroy) and they had escaped from me, but not before doing some serious damage to my precious slug ship, The Man Of War. My slug captain Eoin, the pilot of the ship from the beginning of the mission, was killed in the onslaught. Brave Ariadne, the Rock Princess who defected from her betrothed to join us in our quest, had volunteered to take control in his stead. 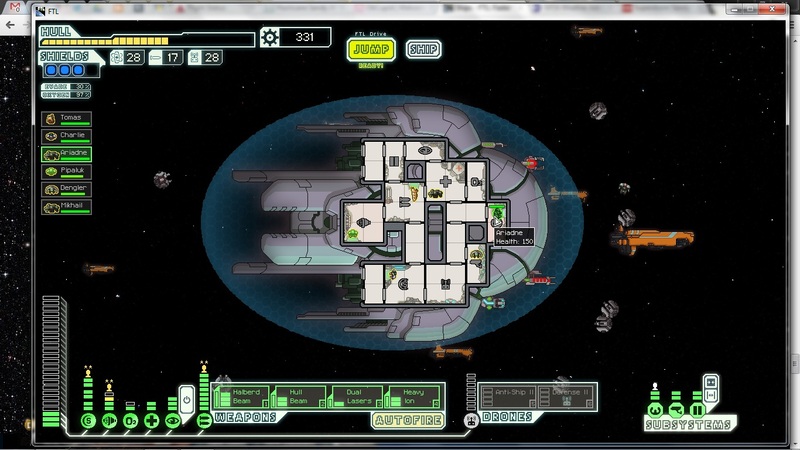 The ship was badly damaged, and victory seemed impossible as the team made one last jump to protect the Federation. They all died after their ship exploded nineteen seconds into the next fight. Pretty awful, right? And there was no going back to that specific ship/crew either. It was gone forever. That snapshot is all that remains (I actually took it thinking about cool it would be if I managed to win with what I had left, but it's actually much better now as the tragic story I posted above). 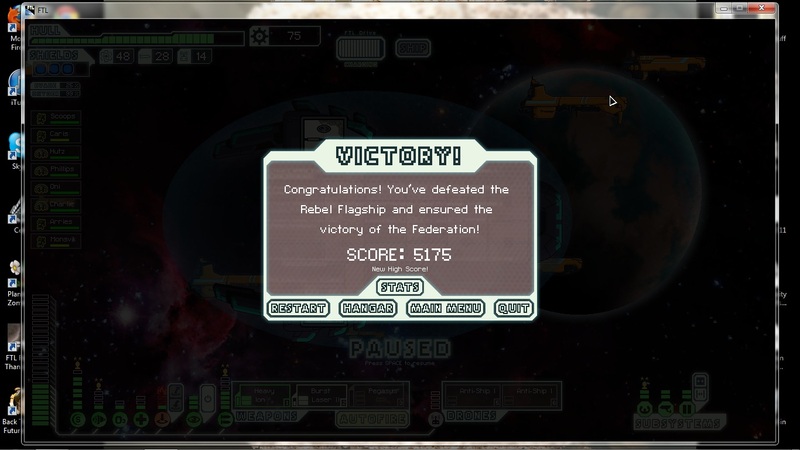 Such is the plight of FTL (Faster Than Light) an immensely difficult, but incredibly rewarding real time strategy game that exists only for the foolhardy in search of a true, old school challenge. You start each game with a fresh ship and crew, and you embark on a quest you are likely to fail. Events are randomly generated, almost every area is hostile towards you, and despite there being no save points in the entire game, the universe makes no attempts to ease your burden. If you barely scrape by after a deadly firefight, you'd better hope the next place you go is a friendly location, otherwise you simply delayed your death by the time it takes to make a brief jump through hyperspace. You have no idea how many of my own ships I had to see explode before I finally saw that page. And even though it sucked dying over and over again, obviously I wouldn't have kept playing if I wasn't having fun every time. But seriously, winning is the best. I used to play games online with other people. Sometimes friends, but more often than not, total strangers. When Xbox Live first came out, I thought it was the most incredible thing, being able to game with other people through the magic of the internet. Then I discovered most people on the internet are people I don't want to interact with in any capacity, including my video games. I say all of this to preface the fact that I had basically lost interest in most online gaming, and also that I figured I'd seen everything that could be done with online gaming in general. That was until I played Journey right at the end of the year. The game is gorgeous, and the titular journey you find yourself on is presented through a wonderful combination of minimalist details - a beautiful, but unobtrusive soundtrack, an open landscape mostly free of typical game clutter like collectibles and monsters, and from what I recall, only two buttons ever needing to be pressed. None of this was interesting enough to me until a second player joined my game and silently (as in, without the ability to talk to me over a headset or otherwise communicate with me aside from in-game "singing") joined me on my quest. It's fascinating how constraints within a game can lead to a stronger connection. 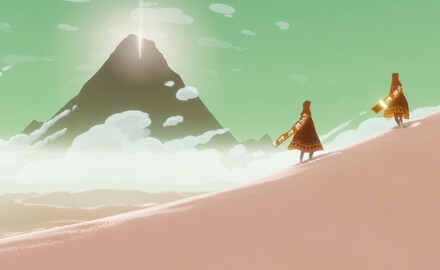 The only goal in Journey is to press on, and should you choose to do that with a partner the game randomly pairs you with (as far I can tell, you can, in theory, succeed on your own), you've now bonded yourself with a total stranger whose goals are forcibly aligned with yours. The game has been stripped of any competitive elements, so in a way, the only choices are to help each other out or ignore each other (and c'mon, why would you do that? take a long hard look in the mirror if that's how you played this game). The person I played with was patient, helpful and friendly (he sung a few notes back and forth with me whenever we on long stretches just trudging along). Those little details reminded me the difference playing a video game with another actual human being makes. No AI partner would understand the stupid little things I was trying to do to test the boundaries of the map, or how many notes your character can sing through rapid-fire button presses, but the person I was playing with totally joined in with me. And it's safe to say that, with only the canvas of the game in front of us to interact with each other, we bonded. To have a connection like that form in such a way is remarkable, and this game definitely deserves all the praise it's been getting. I would be remiss not to mention that among the many hours of board gaming, Dungeon & Dragons/Pathfinder, poker, PAX East and time spent playing party games with friends late into the night (all great moments I consider tied with everything else on this list), my decision to finally try my hands at game creation led to some truly wonderful moments. Watching friends play the game I created - learning the rules, forming strategies, and frankly, breaking it by doing something I hadn't thought of, was a delightful crash course on the intricacies of game design. While I am very much learning as I go, it's been a really fun ride so far, and I'm looking forward to seeing how far I can take my game (and who knows, maybe another!) in the new year. I still can't say too much about Placebo just yet (or more than I said before), but if you live in the NYC area and want to try it out, please drop me a line. This is technically kinda dumb compared to other big moments I've listed here, but when it happened I got so excited I immediately snapped a photo of it and added it to my draft list of favorite gaming moments. So I'm throwing it here at the end as sort of a bonus/footnote. There's this great Xbox Live game that came out over the summer called Dust: An Elysian Tale. It's a 2D action-RPG-platformer-type hybrid, and all you need to know to get this story is that the game has an old school feel to it, with lots of little hidden secrets sprinkled throughout the world. While exploring the 'Sorrowing Meadow' area about halfway through the game, I came upon a single unmarked grave with a rose in front of it. Because I noticed that the game's protagonist Dust looks like he's genuflecting whenever he ducks, I thought it seemed appropriate to do that in front of the grave just because it created a nice little tableau on the screen. I held it there for about 2 seconds, and all of a sudden my controller started to vibrate and I was teleported away to a secret area! What the what?!?! As it turns out, this was another of the game's little secrets that creator/lead programmer (who by the way did almost the entire game by himself, which is incredible) put in there for people like me who will do random things like that while exploring the world. The reward inside wasn't anything super exciting (after all, how much could you lock away in an area hidden so randomly?) but it was still super cool to find it. I later discovered a note hidden elsewhere in the game essentially tells you to "pray" in front of the grave, making the secret a little more accessible to gamers who don't normally make their characters strike poses, but I was still glad I managed to find it on my own. That'll do it for 2012. It's been another amazing year. Can it be topped with even better gaming moments in 2013? Let's go find out, shall we?